If you are not a resident of Pennsylvania you can still earn a nursing degree at Penn State University in four years at a tuition-only cost of $154,600. Or you could get the same education (with brat bun, not frat fun) free in Germany. And you don’t have to speak German? 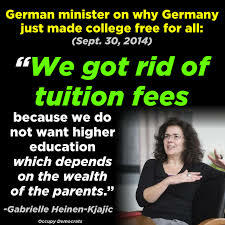 Public universities in Germany charge no tuition to anyone, including Americans , ugly or otherwise. Classes are offered in spoken English. Students, who want degrees (in English) from among the world’s best institutions, can enroll in schools like University of Munich, University of Hamburg or Ruprecht Karl University of Heidelberg, three of the country’s best schools, and pay no tuition. Some years ago the government initiated a $500 a semester tuition charge, but students revolted and it was eliminated. American students enrolled in public universities in Slovenia pay no tuition. All state universities in Norway are tuition-free to Americans and offer courses in English to foreigners, including the University of Bergen and University of Oslo. If you can pay a token amount, universities in France, cost Americans about $247 per year. Finland charges international students $1,650 a year. Doctoral students, and those pursuing their studies in Finnish or Swedish, pay no tuition. The government also offers scholarships and financial aid to international students with notable academic backgrounds. Students seeking research-based doctoral degrees get free tuition in Sweden. And imagine this – some programs of study even offer stipends to international students. Public universities in Mexico and Brazil have virtually free international tuition, only asking registration fees, measured in hundreds, not tens of thousands of dollars. The adventurous might consider studies in China. Americans pay about $3,000 per year, but the best tuition deals are for students who pursue their studies in Chinese. How can a country like Mexico offer courses in English to foreigners at virtually no cost – and, of course, no cost for their own students? The answer is public funding, so everyone gets the same break. It’s a democratic idea more in the style of ancient Greece than in the fashion of Koch Bros’ lobbying to privatize and monetize everything now public in this country. More revealing is how little every other nation charges their local (not just international) students. Only in America do we pay tens of thousands a year for even the very worst schools. – those educational factories with bleary-eyed adjunct professors mumbling to 200 students at a lecture, such a sad corporate-inspired charade of true learning. 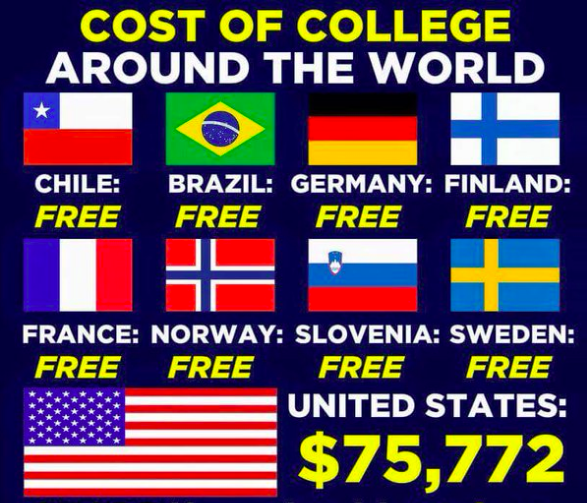 Certainly, some other countries have student debt, but not what you encounter when paying as much as $75,000 a year. Where there is any tuition at all, other societies treat student debt smartly. Australia, for example, with its $5,000 a year (or less) tuition, offers student loans that need not be paid back in any year the graduate earns less than $53,000. In addition, there is no interest ever due on student debt. Reform of our education system must start with equal access for all the middle class, not just for super athletes or recipients of so-called need-based grants for the poorest to attend the worst schools. Free or very inexpensive education is not beyond our national reach, and it is a sad day when even Slovenia can afford what we can’t, just because too many gorged pigs here are devouring our lunch, while denying our due. Future college students and present politicians might find this information interesting. Pass it on with one of the following share buttons.